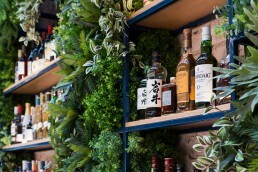 The flavours, sounds and smells of Asia were our starting point for this fitout – a casual, modern Asian bar and diner near the beach in Melbourne’s south-eastern suburbs. We wanted to create a relaxed space with a high-energy vibe and richly textured palette of materials. To achieve this we stripped back the interior to reveal the original walls and by applying a lime wash we exposed the beautifully textured bricks. To maximise the height of the space we envisaged it as an open-air pavilion, by opening up the roof and replacing it with polycarbonate, we create a sense of grandeur whist maximising the amount of natural light coming in. As the sun sets the exposed roof brings a calming serenity, transforming the bustling day venue for evening diners. The result is a relaxed and authentic space that works visually, materially and acoustically, to capture the energy and dynamism of the team’s contemporary Asian-fusion menu.